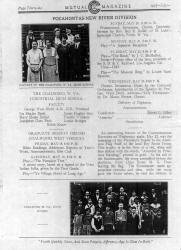 This was a postcard which was commonly distributed to promote the team. 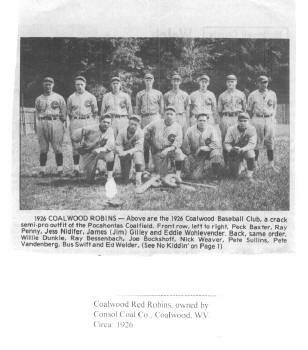 "Having been born in Coalwood in 1932 (two doors down from the house subsequently housing the Hickams), I am curious as to whether you would want photos of the Consolidated-Coal-Company-sponsored Coalwood Robins Baseball Teams of 1920-1927? 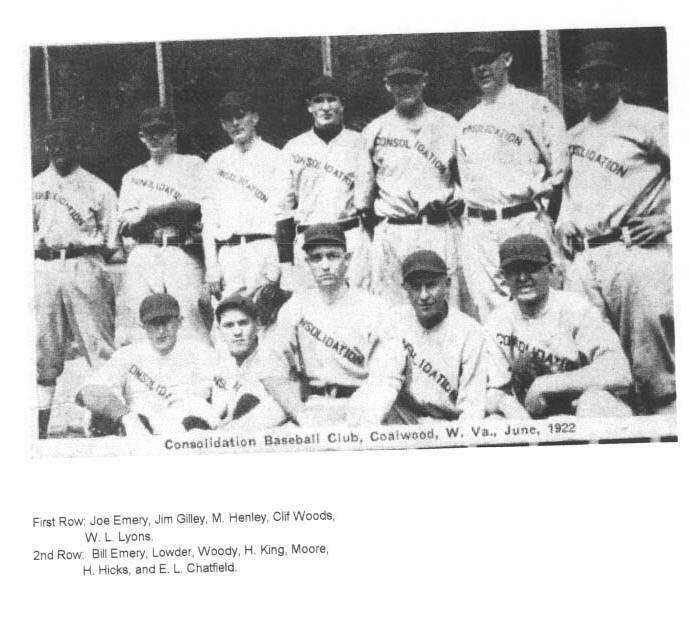 The teams played in the semi-pro Coalfield League at that time. My father (James L. Gilley) was mine foreman for Consul, along with Homer Hickam, Sr., until they sold out in 1934. At that time, Homer, Sr. became the mine superintendent, and Dad transferred to Letcher County, Kentucky, along with others with Consol Coal. Both Homer Sr. and dad played for the Coalwood Robins. 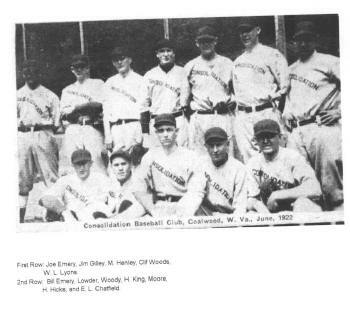 Dad also played at times with the Welch Senators in the 1930s, and Knoxville, Tennessee, the latter a farm team for the New York Giants. He played with Lil Dixie Walker, Paul Derringer, Kelsie Jennings as they progressed up. Paul Derringer was a stand-out pitcher for the Cincinnati Reds ultimately. Dad got married in 1928, at which time Mother laid her foot down that she would not be following Dad on his potential progress to the Major Leagues. Thus, he obtained his release from the New York Giants Knoxville Farm Team in April, 1928.
grad. Welch Maroon Wave 1950"
Of course, we said we'd love to see the pictures which Tim immediately sent. The pictures are shown on this page, and you may click on a picture to enlarge it. Reading from left to right, the team members' names are: Ray Penny, Peck Baxter, Eddie Wohlevender, Ed Welder, Jim Gilley, Willie Dunkle, Roy Bssenbach, Joe Bockshoff, Bus Swift, Jeess Nidifer, Pete Vanderberg, Pete Sullins and Nick Weaver. James L. Gilley wrote the players' names on the photo. Note that a man named Hickam (possibly a relative of Homer, Sr.) played on the team this year. Tim Gilley comments: "This picture was in the Consolidated Coal Company News Chronicle, from which David Goad extracted some of his photos used on his website www.CoalwoodMemories.com. Dad [James L. Gilley] is the tall young man in the middle, back row. David Goad had another photo of a larger class, the 12th, where a male student has his arm around dad's shoulder that was also included in the News, and used by David on his website. I have the original photo, on the back of which has the names of the class members shown in the photo and the teacher's name. Unfortunately it was glued to a page years ago, and when the photo was removed, some of the dark paper to which it was glued has adhered to the back. The names cannot be read. I can only read the name of Mr. Cross as teacher who is presumed to be the gentleman in that particular photo. This Community Center was used also as a theater in the basement, where plays like Tom Thumb (with men totally) were held." The graduating class of Coalwood W.Va. Industrial High School. This building was located next door to the Big Store in Coalwood Main. At one time, the building housed a community center, the Industrial Grade School, and a theater. After the building was torn down, the floor and walls of the basement were covered with concrete and turning into the Coalwood swimming pool! Tim Gilley and his wife Doris. Taken in Florida in the 1980s.